Immunotherapy seeks to harness the power of our human immune system to fight disease. In this rapidly evolving field, collaboration among different stakeholders is essential to bringing new treatments to market. Patient advocacy groups, researchers, hospitals, manufacturers, and government entities all are working together to translate promising new research into life-saving products. Types of immunotherapy include monoclonal antibodies (MAbs) and antibody derivatives, checkpoint inhibitors (immune-modulating proteins), cancer vaccines, T-cell therapies, and cytokines — so the approach involves a range of product modalities: proteins, gene therapies, and cell therapies. Thus, their manufacturing issues run the gamut of bioprocessing. Product development involves specialized clinical trials and efficacy test methods, however. 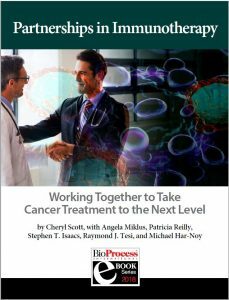 With the complex nature of human immune systems and cancer biology, novel collaborations are needed to turn exciting research into viable treatments. For example, private research institutions collaborate with public entities to gain funding and resources that facilitate their advancement of new therapies. As clinical advancements are made and new treatments or potential cures are developed, the inevitable question of affordability arises. New services and technologies are needed to provide a wide range of patients with improved access to immunotherapies. Novel pricing models may be necessary. Immunotherapies aren’t only for cancer treatment (also, e.g., allergies, infectious disease), but that is so far the largest area of their development. The US government’s “Cancer Moonshot” program has helped to accelerate such endeavors. A number of partnerships have been initiated (Table 1, and see Partnerships and Licensing), many involving Moonshot money, among large and small pharmaceutical companies, research institutions, contract service providers, and disease-focused patient advocacy groups. Each organization has something unique to offer and seeks out particular capabilities in potential partners. Just fill out the form below to download and read the complete eBook now.